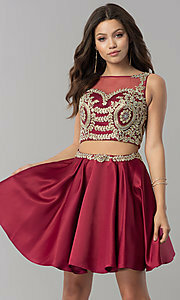 Two-piece short homecoming dresses are on-trend for hoco 2019. This little satin party dress has rhinestone-embellished lace applique that adorns the bateau-neck illusion-sweetheart bodice and encircles the waist of the short skirt. Continuing the elegant pattern, additional applique wraps around to frame the sheer-back on the sleeveless crop top. The gleaming short satin skirt flares in a figure-flattering a-line shape from the jeweled waistline. Offered in misses and plus sizes for homecoming parties and other semi-formals, this lace-applique two-piece satin short party dress offers a youthful style that is selfie-ready.